tadao ando 安藤忠雄 is an acclaimed japanese architect who has designed a host of celebrated projects around the world, including the church of the light in osaka, the expansion of the clark art institute in massachusetts, and the poly grand theater in shanghai. the self-taught architect has also been actively engaged in social contribution projects focused on environmental restoration and post-disaster reconstruction. ando's work frequently combines large expanses of unadorned concrete walls with wooden or stone floors and large windows. ando has held solo exhibitions at the museum of modern art (MoMA) in 1991 and centre pompidou in 1993 and has taught as a visiting professor at yale university, columbia university, and harvard university. 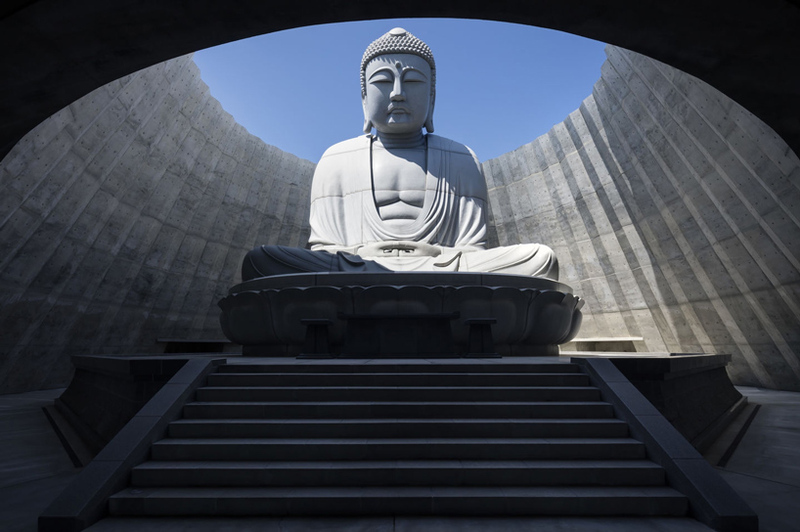 the architect has held the position of professor emeritus of the university of tokyo since 2003.
in a cemetery near sapporo, japan, tadao ando has surrounded a giant statue of buddha with a landscaped hill designed to draw attention to the 13.5 meter-tall sculpture. ando’s brief was to highlight the scale of the figure, which was constructed 15 years ago. the new intervention encircles the sculpture, leaving only the top of its head visible from outside the hill. 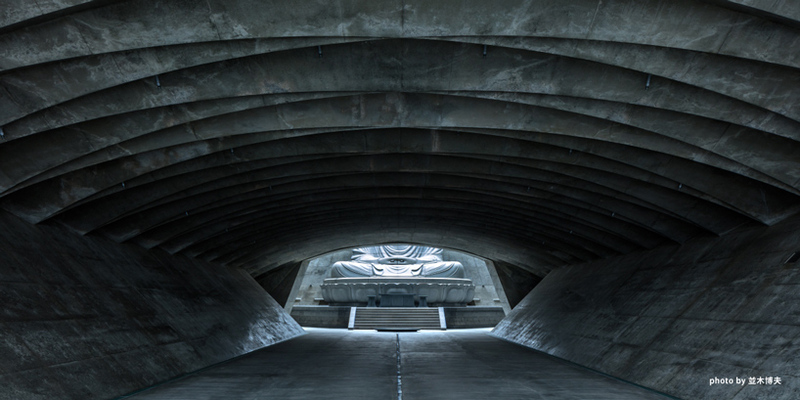 in order to see the rest of the buddha, visitors must navigate a 40 meter-long tunnel that leads to a rotunda that surrounds the statue. ando categorizes the work as a piece of landscape architecture, with its appearance changing depending on the time of year. in spring and summer the site is filled with verdant greenery and vibrant lavender, while in winter months, the cemetery is draped in a blanket of snow. learn more about the project here, and visit the cemetery’s website for more details. 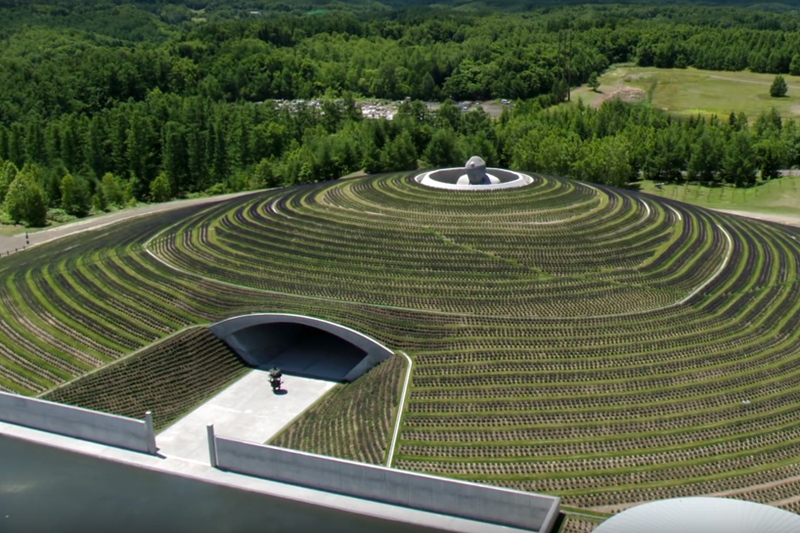 in a cemetery near sapporo, japan, tadao ando has surrounded a giant statue of buddha with a landscaped hill designed to draw attention to the 13.5 meter-tall sculpture. ando categorizes the work as a piece of landscape architecture, with its appearance changing depending on the time of year.